There have been some very positive developments south of where I live which deserve to be more widely known. 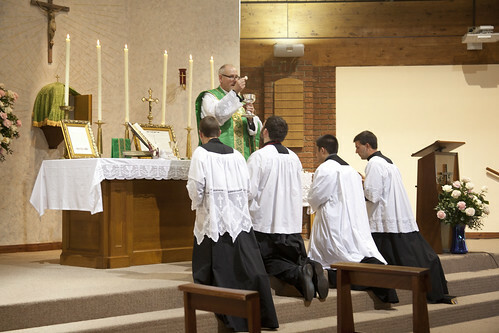 The series of Friday Low Masses in Holy Rood, Abingdon Road, which is in Oxford but in Portsmouth Diocese, which were started for Lent, have continued, thanks to Fr Daniel Lloyd of the Ordinariate. They are at 12:30 pm, in the Blessed Sacrament Chapel of this this modern church. Fr Anthony Conlon, a former National Chaplain of the Latin Mass Society, is now Parish Priest of Our Lady & St John in Goring-on-Thames now has 1962 Vespers on the Third Sunday of each month at 4pm in the second church of his parish, Christ the King in Woodcote: South Stoke Road, Woodcote, Oxfordshire RG8 0PL. More on events in the Portsmough Diocese part of this area (South or West of the Thames) from the blog of the local Representative for Reading and Portsmouth North, Adrian Dulston; I am the Rep for the South of Birmingham Diocese (North and East of the Thames), and my Mass listings page for that is here.